Is there a threat to Orthodoxy in the Middle East? Is there a need to revise statuses of Orthodox Primates? What is the way to avoid division between Orthodox Churches and to make all Orthodox Churches recognize the Orthodox Church in America as soon as possible? Head of the Synodal Department for External Church Relations Metropolitan Hilarion of Volokolamsk answers these questions in his interview with Interfax-Religion. - Recently, reports have spread all over the world about the events in Egypt's Giza where radical Muslim groups killed people and set on fire two Christians churches. Are there real threats to Christianity in the Middle East? - The Middle East is the cradle of Christianity. The history of Orthodoxy is inseparably linked with this region. There are four old Orthodox Patriarchates there, those of Constantinople, Alexandria, Antioch and Jerusalem, and the old Archdioceses of Cyprus and Sinai. In history, the eastern Mediterranean repeatedly became an arena of political and religious wars, and Christians were often victims of those conflicts. Christians and non-Christians managed to achieve peaceful coexistence in some countries of the region, and Egypt was considered one of the examples of such coexistence between the Muslim majority and the Christian minority. However, the tragedy of the last months, beginning from the terrorist attack committed at the Coptic church in Alexandria during the night of January 1, 2011, to the recent arsons in Giza, have stirred up anxiety and pain among millions of believers around the world. Today's developments in Egypt are only a part of the more global process affecting the life of Christians in a number of countries. If the authorities in the Middle East states do not take special measures to protect Christians we will soon see another wave of their emigration. The escalation of Christianophobia in some countries of the Middle East is fraught with very serious consequences for Orthodoxy since it threatens the life of the oldest Local Churches and dooms them to a life without any rights. There is great anxiety about the preservation of common Christian shrines concentrated in those primordially Christian territories. But the greatest pain is over people's ruined life, over those who have had to flee from oppression or to suffer from persecution and sometimes even death at the hands of extremists. I would like to underscore that by no means radical Islamism and extremism under Islamic slogans should be identified with Islam which preach tolerance between people of different religions. I had an occasion to see it a few days ago when I met with the president, professors and students of Al-Azhar, the world largest Islamic university. This university sets as its principal tasks to educate young Muslims in the spirit of tolerance. I was also deeply moved by a letter sent by Farid Salman, chairman of the Council of Ulemas under All Russia's Muftiate, to the president of Al-Azhar, expressing sincere concern over the forced exodus of Christians from Muslim lands. This letter states in particular, 'The continued exodus of Christians from the Middle East countries, attacks on churches and monasteries, the killing of clergy and the hostage-taking of Christians is the best present that could be given to overt and covert enemies of Islam'. Radicalism, fundamentalism and extremism are common enemies for both Christianity and Islam. And the priority task of the leaders of traditional religions today is to educate their flock for not just tolerance towards people of different views and different faith but for love of them. It is only through common efforts that we can stop the wave of extremism which has engulfed the Middle East posing a threat to the very survival of Christianity in some countries in that region. - Recently it has become known that Patriarch Bartholomew of Constantinople intends to invite the primates of the five old Churches to a special conference on the situation of Orthodoxy in the Middle East. What does the Russian Orthodox Church expect from this gathering? - As far as we know, the proposed meeting will have as its subject the situation of Orthodoxy in the Middle East - the place of four old Patriarchates and the Archdiocese of Cyprus which traces back to the apostolic times. In this regard, the meeting in Constantinople will be another one, similar to the meeting which took place last year in Cyprus on the initiative of Archbishop Chrysostom of Cyprus. That meeting was attended by the Primates of the Churches of Alexandria, Antioch, Jerusalem and Cyprus. In the recent months the political situation in the Middle East has become more tense and the problem concerning the situation and prospects of Orthodoxy in the region has become more acute. The urgency of such a meeting in face of so serious a threat is quite understandable. At the same time, there are reports that the agenda of the proposed gathering has also included pan-Orthodox issues arising in the course of preparations for the forthcoming Great Council of the Orthodox Church. And the inclusion of pan-Orthodox issues has been motivated by a special role played by the Churches whose autocephaly is confirmed by Ecumenical Councils and who constitute, as it were, 'the pillar' of the world Orthodoxy. We hold the authority of the old Patriarchates in special respect. But if the matter is common affairs then it is necessary to deliberate all together in accordance with the commonly accepted principles of pan-Orthodox cooperation. Indeed, our common goal is to consolidate the efforts of all Local Churches, regardless of the history of their emergence, in the face of various challenges of our time. 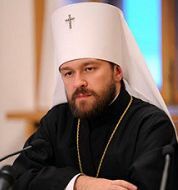 And we certainly cannot agree that a particular group of Churches is regarded as 'the pillar' of world Orthodoxy on the grounds that their autocephaly is older than that of other Churches, for in this case there is a threat of dividing Orthodoxy into first-rate Churches and second-rate Churches. If the Pan-Orthodox Council is to be prepared and conducted properly we should be guided by the ecclesiological concepts which unite Orthodox Churches rather than create new concepts capable of bringing in division and trouble. - In this connection, how would you comment on the recent claims of Archbishop Chrysostom of Cyprus to the fifth place in the order of Orthodox Primates? - In the pre-Council process, the representatives of the Church of Cyprus have advocated the principles of ancience for many years now and proposed that it be put in the basis of the diptych. It is clear however that a consistent use of these principles would result in a radical review of the order of the Primates. In this case, the first place would have to be given to the Patriarch of Jerusalem as head of 'the Mother Church' to be followed by the Primates of Antioch and Cyprus since the apostles' preaching in these Churches is recorded in the New Testament. The next one would be the Pope of Alexandria whose throne came into prominence in the first three centuries of Christianity. The next one would be the Patriarch of Constantinople and the rest. The canonical tradition of the Church knows of other principles of ordering the diptych, whereby Archbishop of Constantinople, considering the ecclesio-political significance of the capital city of the Byzantine Empire, was placed in the 4th century above the heads of the Churches of Alexandria and Antioch, apostolic as they were in there origin. In the same century Jerusalem, restored on the ruins of the ravaged Jewish capital, was given the fifth place to become the fourth after the rupture with Rome in 1054. Should we today subject to a radical review the legacy of the holy fathers of the Ecumenical Councils? As a reminder, the same patristic principles guided the fathers of the Constantinople Councils of 1590 and 1593, which not only granted the title of Patriarch to the head of the Russian Church but also confirmed his fifth place in the diptych for all the centuries to come. Relying on the words of St. Paul, who said, 'No doubt there have to be differences among you to show which of you have God's approval' (1 Cor. 11:19), I am convinced that the matter of ordering the diptych cannot in any way influence our traditionally friendly relations with the Archdiocese of Cyprus and its Primate. This is precisely the reason for the existence of councils in the Church so that all arising perplexities may be resolved in the spirit of peace and fraternal love and preferences may be given to those who have God's approval. At the same time, it would be the most important thing for the people of God to manifest our unity and to show to the world that the Orthodox have not lost the Spirit of Christ and are still capable of living up to the commandments of the One Who said, 'By this all people will know that you are my disciples, if you have love for one another' (Jn. 13:35) and 'It shall not be so among you. But whoever would be great among you must be your servant' (Mt. 20:26). That is why I believe that any review of the diptych whatsoever should not be initiated now. Any further discussion on this theme can only put off the convening of a Holy and Great Council of the Orthodox Church, while this Council is what our flock expect from us. And the people of God not at all expect from us a decision as to the order in which Primates of our Church should be placed in the diptych. They rather expect from us a powerful and inspired witness to the truth of Christ; they expect answers to the questions of how the Orthodox Christian should live in the modern world. Let us hold the Council and show to the whole world that we are united and unanimous and that we are capable of responding to the challenges of our time 'with one mind and one voice'. And let us leave the question of which of the Primates should take which place for the post-Council time. - Beside the problem of order, are there any differences in the number of primates included in the diptych of various Local Churches? And what are the reasons for these differences? - The reason is recognition or non-recognition of the autocephalous status of the Orthodox Church in America. Along with the Russian Orthodox Church, the one who granted autocephaly to the former American Metropolia in 1970, this status of the Church in America is recognized by some other Local Churches. Nevertheless, regardless of recognition or non-recognition of the autocephaly of the Orthodox Church in America, nobody challenges the canonicity of her archpastors and clergy. It enables her to be a full-fledged participant in the common life of the Church by sending her representatives to numerous inter-Orthodox meetings. The more bishops and priests of this Church participate in common church events, the sooner, I believe, this matter of the pan-Orthodox recognition of her status will be settled. And it is very important that the Primate of this Church, equally with Primates of other Local Orthodox Churches, should participate in inter-Orthodox events every time when invited. Indeed, the presence of the Primate of the American Church in inter-Orthodox events will be the most eloquent testimony that this Church is serious about her autocephaly and makes efforts to have this autocephaly recognized by other Local Orthodox Churches as well.